3.Long time without sunny day, AA Battery can be used as backup power. 4.100% Waterproof,Hang the lantern to anywhere with full sunlight. 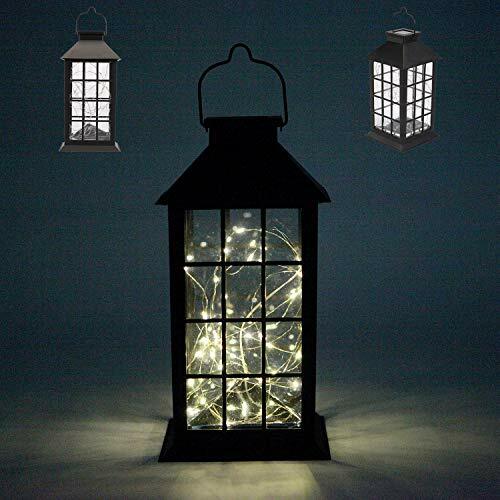 Material:Durable Plastic with real glass+Waterproof 30LED Warm White String lights, to be able to withstand various weather conditions outdoor. With handle and also bottom size:5.5x5.5inch,height:13.4inch, to sit on any surface or be hung using the integrated hanging loop. Solar Powered LED Hanging Lantern, with efficient solar panel,1.2 V 600mA Rechargeable AA Battery (Pre-Installed).If not a bright day, AA batteries can be used as a back-up power. Charging Methods:Charged automatically when put Solar-powered lantern directly under the sunlight(slide the switch to the "ON" position when charging).Generally charged in the sun 6-8h will light up 8-12h. Light Sensor Design:Automatically turn on in darkness and turn off in daytime, also with Off/On Switch for easy control and energy saving. Warranty: All of our Solar Hanging Lantern Lights are guaranteed with 100% Money Back if not satisfied within 30 days. If you have any problems with your solar Lantern Lights, please feel free to contact us. If you have any questions about this product by Sunlane, contact us by completing and submitting the form below. If you are looking for a specif part number, please include it with your message.